*If there is not a training date that works you can request a date. 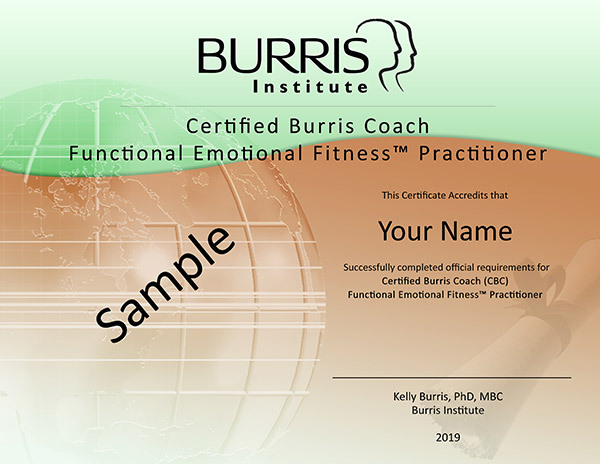 Functional Emotional Fitness™ Practitioner Training takes three days, four hours per day and will take place on the Burris Connect website. Certification Requirements: After your Training, you are required to put three people through the Functional Emotional Fitness™ process with before and after data collection and one follow up. Certification Timeline: If you have three clients lined up prior to training, you can complete your certification in as little as two weeks. After completion of your certification, you will go Live at BurrisConnect.com and be ready to start accepting new clients. You can stay at the top of the page at Burris Connect simply by signing in every day. Your first year of Burris Connect Support is now included with your training.